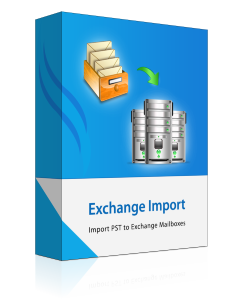 Import Outlook PST Files To Exchange Server Mailbox. Import PST to Exchange Server mailbox in bulk. Selection of Multiple Files and selection of the entire folder with PST files is possible. The PST files of any size can be imported. The manual searching and auto-searching of PST files is possible. It provides an option to search file across local network provided that the access to the specific machine is granted. The software import pst to exchange mailbox with all the details such as emails, calendars, journals, etc. The importing of these details is directly done to the Exchange Server. The importing of files to a specific account can be done only if the Account name is known. In-order to import the PST files the Administrative privilege is needed. The account should be provided with full access privilege. When the PST files are add for importing, then the status report of the conversion process is shown for each item such as emails, calendars, tasks, etc. the final report is generated after the successful conversion. The mapping feature of tool helps to Import PST to Exchange mailbox. For doing this, you need to provide the Some account name i.e. mail box nick name. After this, each PST file imported within the respective mailboxes of Exchange server database. Step 2: Add Files & Folders. Demo version of Exchange Import tool Convert 50 items from PST mailbox selected. Can I import my contacts in PST into Exchange mailbox? Yes, you can import your contacts, calendars, journals etc. into Exchange mailbox. My PST files got corrupted, can I import these files? No, the importing of corrupted files is not possible. This tool is definitely a magical solution. I moved 20 PST files into different mailboxes in just one go. Thank you guys.